These super moist and flavorful cranberry orange muffins use oat flour, making them 100% whole grain and gluten-free! With a dairy-free option. 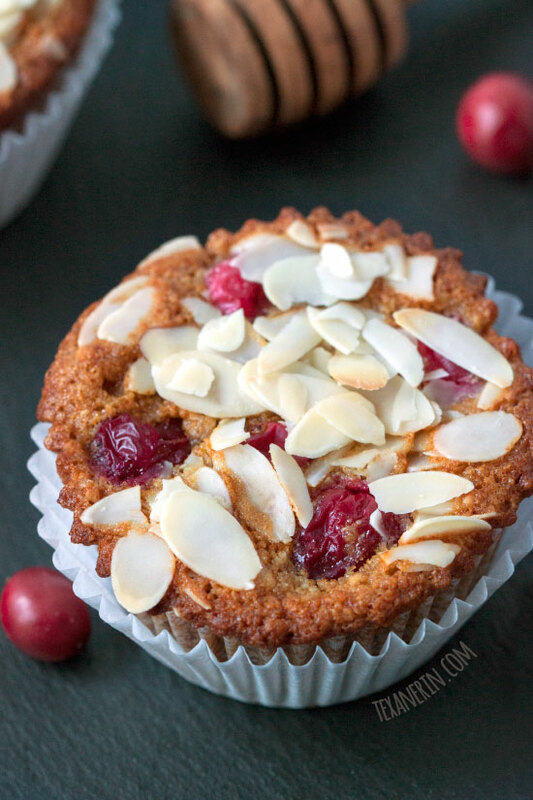 My latest post over on My Baking Addiction is these gluten-free cranberry orange muffins. I hope you all aren’t sick of the orange and cranberry combination yet because these are so worth making! I went through 8 versions of a different recipe until I finally just decided it’d be easier to adapt my whole grain apple muffins. Those are already pretty moist and soft and weirdly enough, the oat flour makes them even moister and more delicate! If you don’t want to use oats and don’t need them to be gluten-free, white whole wheat flour works, too. But make sure to go with white whole wheat and not the traditional kind! Unless you don’t mind the muffins tasting grainy. I used buttermilk in these muffins but I’ve listed a way to make homemade dairy-free buttermilk in the recipe. The same lemon juice + milk trick works with dairy-free milks, too! Except for canned coconut milk. I’ve never tried it and it’d be too thick, anyway, so stick to soy, almond, oat, etc. milk. These cranberry orange muffins are entirely honey sweetened and you can taste it, but it’s not overwhelming at all! Orange is definitely the predominant flavor here. I don’t recommend subbing honey with anything else. It’s a large amount to sub (2/3 cup) and I’m afraid using anything else would throw off the entire recipe. Preheat oven to 350°F and line a muffin pan with 12 muffin liners. In a medium mixing bowl, whisk together the oat flour, baking soda, baking powder and salt. Set aside. In a large mixing bowl, whisk together the eggs, honey, oil, orange zest, orange extract, vanilla extract and buttermilk. Add the dry mixture to the wet mixture and stir just until combined. Stir in 1 cup cranberries, reserving the rest to sprinkle on the top. Divide the batter among the liners, filling almost to the top, and sprinkle the remaining cranberries over the top. Add sliced almonds, if using. Bake for 16-20 minutes or until a toothpick inserted in the middle comes out clean. Let the muffins cool for 5 minutes in the pan and then carefully turn them out onto a wire rack to cool. If you used almonds, you may want to tilt the pan and use a spoon to remove them from the pan so that the almonds don't fall off. Once cool, store in an airtight container at room temperature for up to 2 days or refrigerate for 4 days. To make oat flour, pulse gluten-free oats in a food processor or coffee grinder until finely ground and powdery. For dairy-free buttermilk, put 1 1/2 teaspoons of lemon juice in a 1/2 cup measuring cup. Fill with dairy-free milk (almond, soy, oat, etc. but not canned coconut milk), and let sit for 5 minutes. 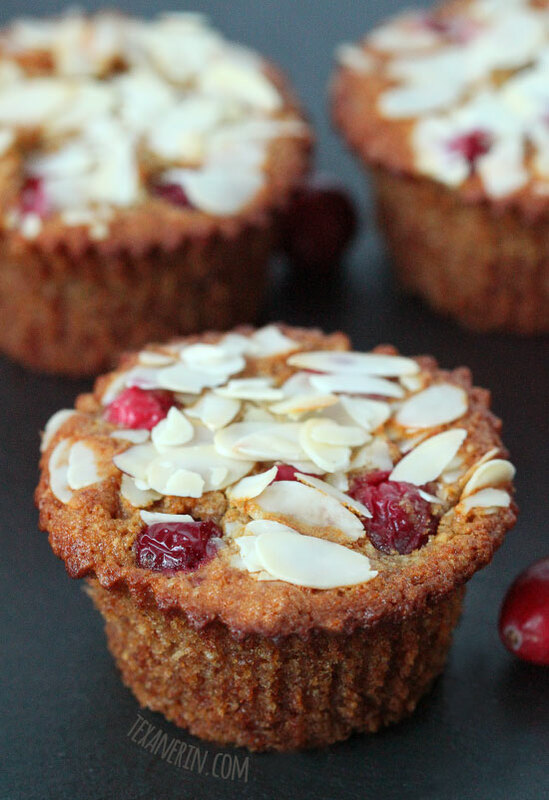 43 comments on “Cranberry Orange Muffins (gluten-free, whole grain, dairy-free)” — Add one! Made these muffins and they were AMAZING but SUUUUUUPER crumbly! can anyone think of why? I did accidentally overcook them by 2 or 3 minutes but that usually doesn’t make a difference…? I’m happy you enjoyed them! It’s because there’s no gluten in them so there’s nothing holding them together. But I’ve never had this issue so I’m not sure what the problem is! Baking them longer makes them drier and crumblier but they still shouldn’t be super crumbly. I hope you could still enjoy them! I’m sorry I don’t have a better answer for you. Hi Erin , can I make the oat flour by processing instant quaker oats or does it have to be rolled or steel cut? Hi there! I’m pretty sure it needs to be quick oats or rolled / traditional oats. I don’t think instant would work and am doubtful about steel cut! I used melted coconut oil and it worked just fine!! The sliced almonds definitely shouldn’t be optional. They are the perfect addition. I cut down honey to 1/2 c and it was still plenty sweet! Thank you for a fantastic recipe! Wow! These are truly amazing. I made three small changes: I used half oat flour, and half Bob’s GF all purpose flour; I swapped maple syrup for the honey in equal amount; and I added 3/4 tsp of xanthan gum. They came truly divine. Crispy on top, light throughout. Great recipe! And my house smells phenomenal now, too! I love that you used maple syrup. Sounds delicious! I’m so happy these came out well for you, especially with the changes you made. :) I’ll have to try your version and see how they compare. Thanks so much for your feedback! I hoard fresh cranberries in the freezer so that I can bake all the cranberry orange things all year long–it never gets old. I look forward to trying these muffins! Haha. That’s clever. Every October I go crazy looking for cranberries! wow perfect combo : cranberry & orange. The sliced almond make the muffins look so tempting. Hellllllooo beauties! I shall call you breakfast! I will never in a million years get tired of cranberry + orange. These muffins look great! Nope, most definitely not sick of anything cranberry and orange. I love that combination and the fresh cranberries in them too. Those almonds on top are a lovely finishing touch. These are perfect and I love the cranberries in them! I would love to have a batch of these in our freezer, just waiting to be eaten for snacks or breakfast. Cranberry and orange are just meant to be together! Oh that is THE BEST flavor combo! 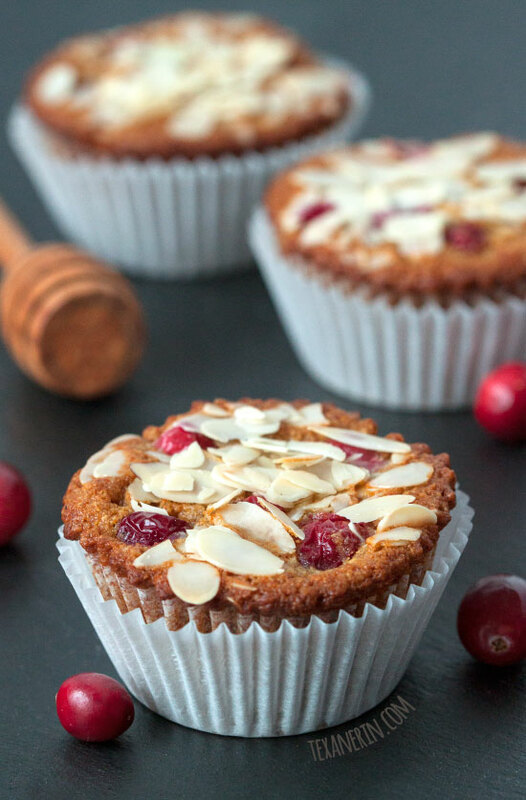 Nothing compares to fluffy muffins packed with fresh cranberries! The almonds on top? Even better! I love everything about these, but most especially the little almonds on top. They are so beautiful! These look delicious! We have a family member on a GF, DF diet and I’m always looking for baked goods that he can enjoy! Thanks so much for sharing! I love muffins made with buttermilk! Cranberries+orange=marriage made in heaven. Right?? Love these! Oh, how I love the orange and cranberry flavor combination in baked treats! Your muffins look irresistible, Erin. Cannot wait to make this recipe. Thanks ever so much for sharing and have a wonderful rest of the week! I love orange and cranberry. I like dried cranberries better though. All the fresh ones I have use are soon sour. Thanks so much, Sam! And I think your cookies may need lots of orange extract and orange zest. :) I think honey just detracts from the orange flavor!